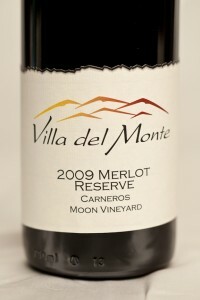 The 2009 Merlot Reserve Carneros was selected “as a great example of its varietal and its producer.” This 100% Merlot from the Moon Vineyard in the Los Carneros appellation in Napa, California has a deep burgundy color, a delicious raspberry chewiness, and a smoky, sultry aroma. Renee Chazottes, a Sommelier and one of the wine competition judges, described the wine as “ Black Cherry; deep fruit, ripe. BIG oak; cola-berry. Big wine; bold and plush. Big extraction; round and smooth. Chocolate.” This Merlot has a perfect balance between fruit, oak, and tannins.